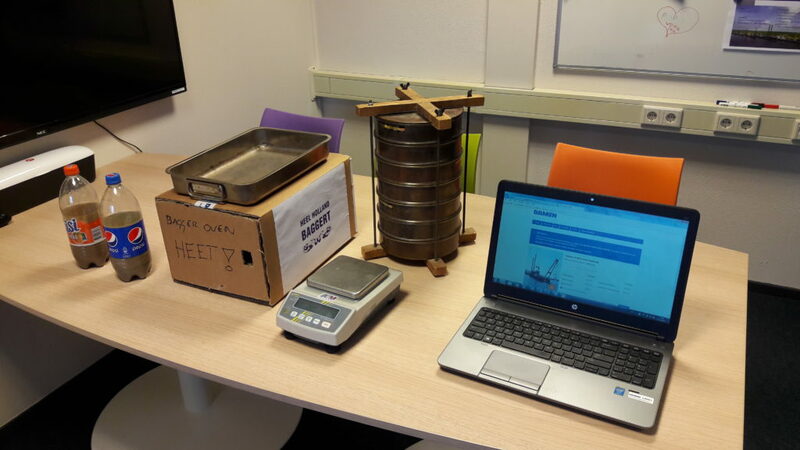 Recently I had to give a demonstration on one of the aspects of my work: investigate what type of soils the customer will be encountering, what type of dredging equipment is most suitable for that application and what will the production be under those conditions. At this demonstration, the purpose was, to show how I can make something simple very complicated in a short time. The challenge here will be to take you with me on this precipitous path to enlightenment. The example case was to examine two different soil samples. Each was artificially mixed, but representing a Particle Size Distribution of two different borrow areas. 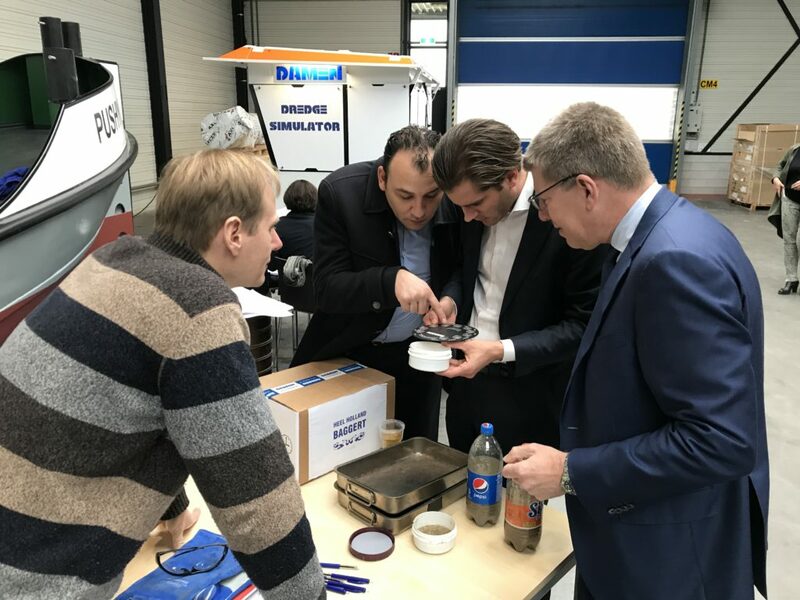 The samples are delivered in widely available standardised containers. Yeah, you recognised them: 1.5L soda pop bottles. As the samples were wet, they had to be dried. Normally, this can take two to three hours. Here we applied a magical temporal acceleration by employing a Calvin style cardboard box as an oven. The literal main ‘activity’ for the participants was to manually shake the sieve tower. Rest assured, in our own soil analysis lab we use an industrial automatic sieve tower. This antique specimen comes from our museum. The separated fractions from the sieves, then have to be weighed and finally plotted in a so called particle size diagram. Horizontally you can take a sieve diameter and vertically you can read what mass percentage will pass that mesh diameter. Although both samples have the same median diameter d50 (354µm), which is indicative of the general particle size, the distribution is very different. Sample A is almost totally the same diameter, where sample B has a broad distribution. A measure for the distribution is the Uniformity Index (d60/d10). 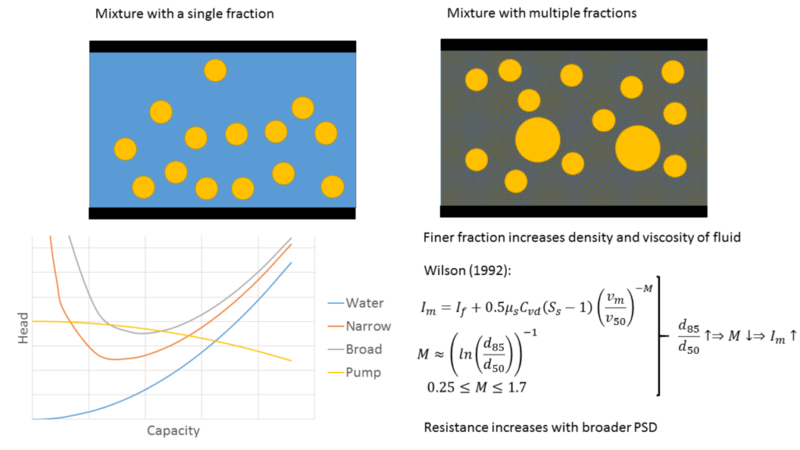 Another important figure to be taken from this graph is the silt fraction. This is the percentage of particles that is smaller than 63µm. More parameters can be taken form this graph, but these are the most important for now. From the equation for the critical velocity, the uniformity index plays an active role. If the uniformity index increases, there is more fine material. Fines tend to increase the density and viscosity of the fluid. Consequently the resulting mixture behaves like a heavier fluid, carrying larger particles. Effectively, the resistance of a non-uniform sand is higher than for a more uniform sand mixture. 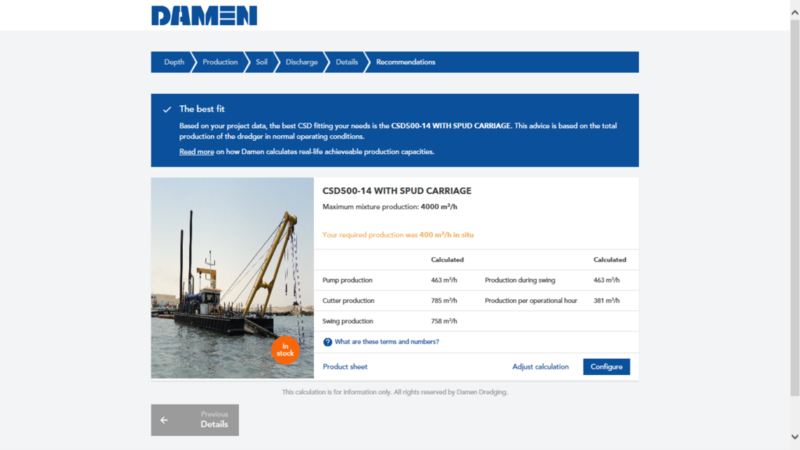 Another aspect of the dredging process is the ability of the CSD to excavate the material from the bottom. Here the uniformity index has the complete opposite influence. A uniform sand distribution will have a lot of voids between the grains. The particles will move easily over each other. When there are lot of smaller particles available, they tend to clog up the voids and bond the bigger particles in a gridlock. These sediments are very hard to excavate. If no geotechnical investigation is available, the PSD can help to estimate a SPT. With the grains size and the SPT, the audience consulted our lovely looking assistant ‘Sandy’ for a first selection of the required CSD.